Category: Body Care. Tags: €10 & under, anatomicals, body lotion, body lotion for men, body lotion for women, body scrub for men, cheap body scrub, Not Another Rough Day Please, tanatomicals. Things alas cannot always run smoothly as you would like. but no matter how rough your hour/day/week/month/year/lifetime/after life turns out to be, your body will be always incredibly smooth, thanks to this light fragranced body lotion. sorry, but an asteroid has just gone and smashed into your car. Having a bad day? 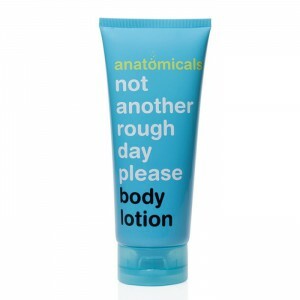 Fortunately your skin won’t be with this fabulous body cream from Anatomicals. With a delicious fragrance and silky texture it will smooth away even the roughest dry patches for soft, hydrated and healthy skin. It is a smoothing body lotion for all skin types. The body lotion is mildly fragranced, not so overwhelming but still leaving with a refreshing feeling. It has consistency of a thick cream rather than a lotion. You would expect it to be greasy but it is not. It is very moisturizing and leaves no film over your skin. Anatomicals not another rough day please apply to body and work it in.